Surgical procedures are done daily, and while some are extremely common, we consider none to be routine. At the Animal & Bird Health Care Center great care is taken that nothing interfere with continued patient monitoring whenever anesthesia or sedation is needed. We pride ourselves on the record we have established with respect to our surgical successes. 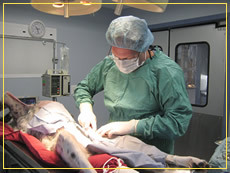 From spays and castrations of young dogs and cats to orthopedic surgery on a bird, from removal of a cyst on an elderly cat to removal of an intestinal obstruction from the intestine of the overcurious ferret, all surgeries are performed with the most modern anesthetics. Monitoring of all parameters of our anesthetized patients is performed using sophisticated equipment measuring heart rate, temperature, and oxygen saturation of the red blood cells, as well as pulse and respiration. A continuous EKG is also employed for the saftey of your pet undergoing a surgical procedure. ​For procedures where a board certified surgeon is required, we maintain close working relationships with several referral facilities to ensure the best outcome for your pet.